Would you like to be a lifeguard? 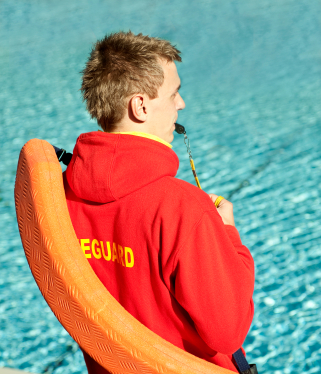 The Royal Life Saving Society National Pool Lifeguard Qualification is widely recognised as the appropriate qualification for those responsible for the supervision of swimming pools. This course is of 38 hours duration and covers accident prevention, water rescue, first aid / resuscitation procedures and more! Candidates must be 16 years of age or over. The National Pool Lifeguard Qualification (NPLQ 8th Edition) meets all the criteria required for the training and certification of pool lifeguards and is accepted by most swimming pools as the benchmark qualification needed to work as a lifeguard. The qualification is in two units. Unit 1 provides training and assessment in a knowledge of the general aspects of pool operation, supervision, accident prevention and rescue skills, along with resuscitation and First Aid. Unit 2 puts the skills and knowledge into practice at the pool training venue. Both units are required to complete the qualification. Any one over the age of 16 can apply to become a lifeguard. However you must be able to complete the following before commencing the course. Upon successful completion certification is valid for 24 Months. All successful candidates will receive a NPLQ certificate from the Royal Life Saving Society. Are you a Leisure Centre Manager looking for a training provider? If so please contact NDA on 01494 958 547 and we will be happy to discuss your training needs.